Fort Wingate (2) (1860-1993) - A U.S. Army post established in 1860 as Fort Fauntleroy (2) by Captain William Carpenter, 5th U.S. Infantry, near present day Gallup in McKinley County, New Mexico. Renamed Fort Lyon (5) in 1861 but the garrison was withdrawn in 1861. Reestablished at the original site in 1868 as Fort Wingate (2). Placed on caretaker status in 1912. Reopened as Wingate Ordnance Depot in 1918 during World War I. 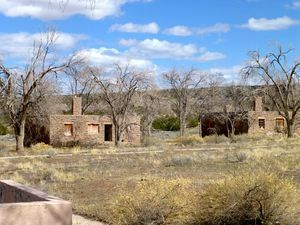 The cantonment area was turned over to the Bureau of Indian Affairs for use as a Navajo School in 1925, leaving the remainder as Wingate Ordnance Depot. Wingate Ordnance Depot was renamed Fort Wingate Ordnance Depot in 1960 and Fort Wingate Army Depot in 1962. The 1993 Base Realignment and Closure Commission (BRAC) closed the depot activity. Depot environmental and demilitarization activities continue to date. Initially established as in 1860 as Fort Fauntleroy (2) by Captain William Carpenter, 5th U.S. Infantry and named after Colonel Thomas T. Fauntleroy, 1st U.S. Dragoons. Colonel Fauntleroy resigned his Federal commission at the beginning of the U.S. Civil War and the War Department renamed the post Fort Lyon (5) on 25 Sep 1861 after General Nathaniel Lyon, who was killed 10 Aug 1861 at the Battle of Wilson's Creek. The garrison was withdrawn on 10 Sep 1861 but the U.S. Army maintained a mail station at the post and used both names during the war. 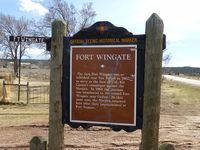 In 1868 the post was renamed Fort Wingate (2), taking the name of the nearby Fort Wingate (1) who's garrison was transferred to the post when it was decommissioned. On 18 Feb 1870, President Ulysses S. Grant declared a 100 square mile reservation around the post and on 26 Mar 1881 another 30 square miles south of the reservation was added. A catastrophic fire swept the fort on 2 Jul 1896 and it was rebuilt with more substantial materials. The post was upgraded in the early 1900s but the garrison was withdrawn in 1911 leaving just a small detachment. The post was placed on caretaker status almost immediately after New Mexico achieved statehood early in 1912. The post was reopened as Wingate Ordnance Depot in 1918 during World War I to store munitions being returned from Europe. 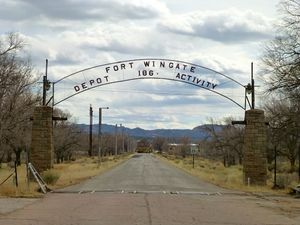 The cantonment area containing most of the post buildings was turned over to the Bureau of Indian Affairs for use as a Navajo School in 1925, leaving the remainder as Wingate Ordnance Depot. Wingate Ordnance Depot was renamed Fort Wingate Ordnance Depot in 1960 and became Fort Wingate Army Depot in 1962. The 1993 Base Realignment and Closure Commission (BRAC) closed the depot activity but retained some 10,000+ acres for missile launch and testing. Depot environmental and demilitarization activities continue to date. At the town of Fort Wingate, McKinley County, New Mexico. Marker at the entrance to the abandoned school site. The schools site contains a mix of buildings including the 1906 two story barracks building. The old school grounds are fenced and access is limited. The Depot entrance is alongside Interstate 40 on the south side. It can be reached by the northside access road and a tunnel under I40. Location: Near the town of Fort Wingate, McKinley County, New Mexico. This page was last modified 20:37, 7 January 2019 by John Stanton. Based on work by Bill Thayer.